I have two cards of Henderson Alvarez. This one is from 2013 Topps. Playing career: Henderson Alvarez pitched for the Blue Jays and Marlins from 2011 to 2015. A no-hitter with the Marlins in 2013 foreshadowed a career year in 2014, when he went 12-7 with a 2.65 ERA. 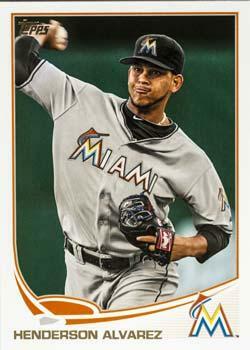 He was named the Marlins opening day starter for 2015 but was injured and out for the season before the end of April. Where he is now: Signed with the A’s for 2016. My memories: I remember hearing about the no-hitter and having no idea who he was. That’s all I remember him for. Google Autocomplete results: He is first when you type Henderson A, ahead of Henderson Apartments Rutgers, referring to campus housing. There do not appear to be any other prominent Henderson Alvarezes. Coming up next: The next profile will be Keto Anderson. Outfielder Mike O'Keefe played seven seasons of professional baseball, mostly in the Angels organization. His best season was 2001, when he hit .330 with 15 HR and 91 RBI at Rancho Cucamonga. Now owner of the CrackerJacks Baseball and Training Facility in Meriden, CT, he kindly answered my questions about baseball cards. 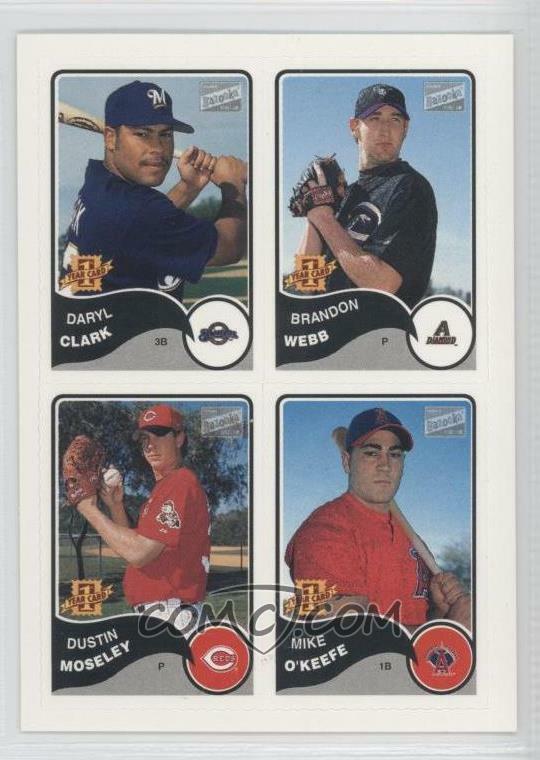 "My favorite card was probably the Bazooka card that I was on with Brandon Webb, Dustin Moseley and Daryl Clark. I had around 12 ABs off Webb. When you hear of someone that throws a heavy ball with drop, that's Brandon Webb. I would always ground out against him. I remember one AB I hit the ball square off the barrel and it felt like the ball weighed 5 lbs. I did collect baseball cards when I was a kid. I never knew about the monetary value that some cards had. I just loved opening a pack hoping I got some Yankee players. When I was 10 years old I decided to take my cards and make wallpaper in my room out of them. It took a long long time but when I was finished I was proud but realized any card worth anything ... Wasn't LOL!!!" 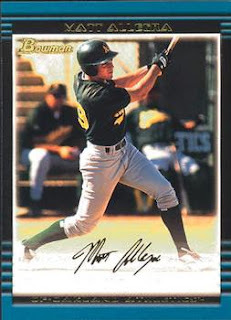 I have one card of Matt Allegra, from 2002 Bowman. Playing career: Outfielder Matt Allegra played eight seasons of professional baseball, mostly in the Oakland organization. In 732 games he hit .247 with 89 HR and 414 RBI. Where he is now: Works in business development for Florida Catastrophe Corp., and is an assistant baseball coach at Orangewood Christian School. Google Autocomplete results: He is fifth when you type Matt Alleg, between Matt Allegrucci, Chief Ethics & Compliance Officer at Daiichi Sankyo, and Matt Allegrezza, a member of the Wheaton College basketball team. Another prominent Matt Allegra is a firefighter in New Jersey. Coming up next: The next profile will be Henderson Alvarez. A while back Dan from The Other World had a giveaway of cards by division. He sent an awesome collection of several hundred cards of the five current AL West teams. He also threw in a little bit of Yankees awesomeness! 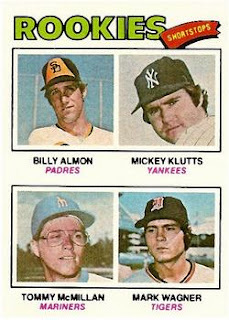 Here are a sample of one card from each team from this great box. Ruben Sierra was one of my favorite Yankees. I know he wasn't popular with every fan but there was always excitement every time he was up. This is a great shiny card of him. Speaking of Yankees out of pinstripes, I had completely forgotten about Hideki Matsui's time with the Angels. Also very shiny. And, as you can see, reflective too! He included three Yankees, all high-end. Recent cards of Mickey Mantle and Derek Jeter, and this awesome card, a uniform card of Jorge Posada. This is probably the best uniform card in my collection. 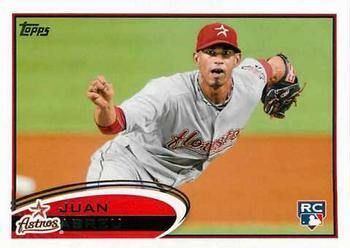 I have one card of Juan Abreu, from 2012 Topps. Playing career: Juan Abreu pitched for the Astros in 2011. In seven games he went 0-0 with a 2.57 ERA. 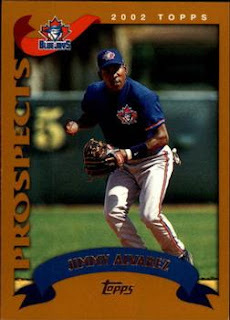 Where he is now: Anyone know where Juan Abreu is now? Google Autocomplete results: He is second when you type Juan Ab, between Juan Abad, a playwright, and Juan Abello, a pharmaceutical executive. Another prominent Juan Abreu is a writer. 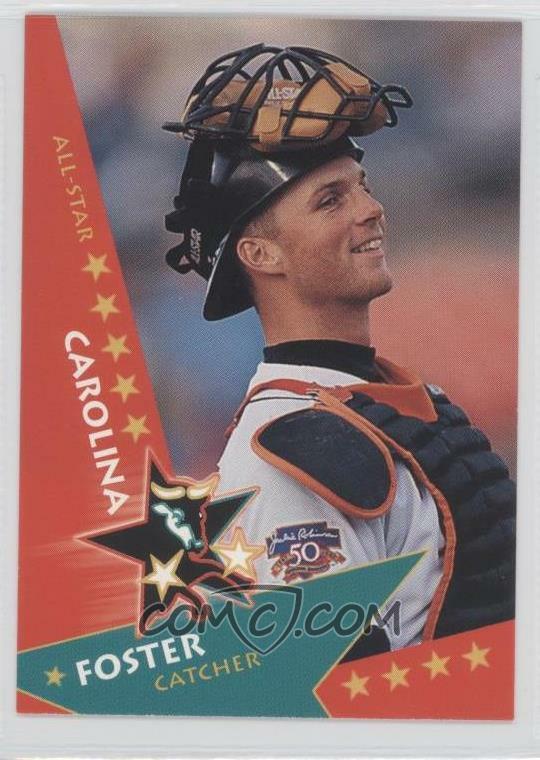 Catcher Jim Foster played eight seasons of professional baseball, mostly in the Orioles organization. In 770 games he hit .273 with 71 HR and 426 RBI. Now Associate Head Coach & Recruiting Coordinator at Boston College, he kindly answered my questions about baseball cards. "One of the best experiences of my life was getting my first baseball card, its something you dream about having one day and when it actually happens it is pretty amazing, something you never forget. One of my favorite cards is an action shot of me catching in the Carolina League for the Frederick Keys, I had a big smile on my face you can see how much I enjoyed playing in that shot. It was a fun season, great group of guys. They all are pretty special to me. I collected when I was a kid, I remember my grandfather saying if I found Billy Almon's rookie card he would buy me another set, I looked and looked for it and found it, then he got me the full set for the next year. I still have people at the ballparks we go to approach me with cards from when I played, it is very flattering and humbling to still be asked." Mike Misuraca pitched nine seasons in the Twins and Brewers organizations, winning 71 games. He made the major leagues for five games with Milwaukee in 1997. Now a scouting supervisor for the Cincinnati Reds, he kindly answered my questions about baseball cards. "I don't collect cards, I do however, have: Kirby Puckett, and Roger Clemens rookie card (85 Fleer Update), that are pretty much the extent of my collection." Infielder Matt Macri played eight seasons in the Rockies and Twins organizations, hitting double figures in home runs four times. 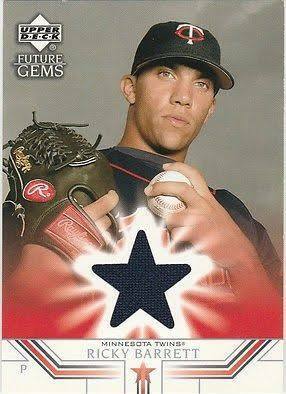 He made the major leagues with the Twins in 2008 and hit .324 in 18 games. Now a Vice President at Steinco Corporate Real Estate Advisors in Chicago, he kindly answered my questions about baseball cards. "I do not currently “collect” cards, but when I was young I had a collection and I still have those books of cards to this day. Some of the best cards I have were from a, I believe 1992, Topps Black Gold Edition set. I opened a standard set of cards and found one informing me that I had won the Black Gold set. I mailed in the card and received the BG set a couple weeks later. I never opened the set so the 30 or so cards (in bunches of 5) are still in their plastic. I’ve never valued them, but I assume they are my most valuable cards. There is a Topps card of me when I was playing for Minnesota; it is of me running the bases. The photo was snapped as I’m rounding third base after hitting my first MLB homerun in Cleveland. Why this moment sticks in my mind, besides the fact that it was my first (and only) MLB homerun, is because of the backstory for the expression on my face. I had pulled my left calf muscle early in the season while playing for Minnesota’s AAA team in Rochester and only a few days after coming off the DL I was called up. At the time my calf was fine and I found no trouble in playing on it. But, only a few steps out of the box after hitting the ball my calf began to cramp. As I rounded first and started into my trot my calf was in a total knot. The only thoughts running through my head were that my coaches will notice a limp or that I’m going to have to stop and walk around the bases, on my first homerun! Fortunately, I was able to continue a jog and make to the plate, but not without an expression of worry and concern as captured around third by this Topps card." Second baseman Demetrius Heath played four seasons in the Tigers and Angels organizations. In 223 games he hit .278 with 2 HR, 76 RBI and 48 SB. Now the owner of Central Florida Prospects baseball instruction, he kindly answered my questions about baseball cards. "I do collect baseball cards I have about 200,000 cards my favorite are Jeter rookie cards along with Mike Trout and many more!!" Ricky Barrett pitched in the Twins organization from 2002 to 2008. 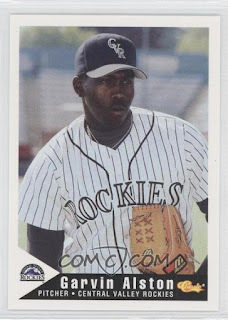 In 199 games he went 30-16 with a 3.35 ERA.Now a mortgage loan officer at First Priority Financial in Sacramento, he kindly answered my questions about baseball cards. "My very first card I ever had signed was a Donruss 1990 Mark McGwire All Star card. The funny story about it is that I handed it to him right side up facing me and he didn't bother to turn it around to sign. So he signed it upside down. Still have that card on my desk in my office. Another great story was again at the Coliseum in Oakland when the A's were playing against Cleveland. Greg Swindell was standing in the bullpen and started to sign autographs. He came over and signed my card and asked if I wanted to play catch. I didn't bring my glove with me and so I had to borrow my friend's that came with me to the game. Well my friend was right handed. Greg, having noticed this, gave me his glove to use and he used my friends. We played catch for a few minutes and then he signed the ball we were throwing with. One of the cooler moments of my childhood. 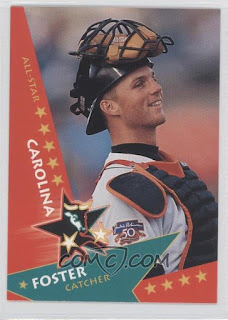 My favorite card of myself would have to be the Upper Deck Jersey card from 2002. I don't really collect anymore, although I do still have most of my collection as a kid stored in a very old Michael Jordan shoe box. I believe it was the Jordan IV's. (I do collect Jordan shoes now, lol)"
Thanks! 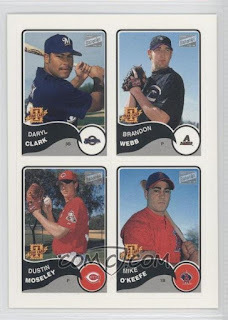 I don't have that card, but here is one I do have from 2005 Topps. I have one card of Jimmy Alvarez, from 2002 Topps Traded. Playing career: Shortstop Jimmy Alvarez played eight seasons in the Twins, Blue Jays and Red Sox organizations. In 725 games he hit .255 with 36 HR, 281 RBI and 114 SB. Where he is now: Manager of the Twins’ Dominican Summer League team. Google Autocomplete results: He is second when you type Jimmy Alv, between Jimmy Iovine, a record producer, and Jimmy Alvarado, a punk musician. There are no entries for the ballplayer on the first page of Google results; the first entry is for a fashion photographer. Labelscar is the term for when a sign is removed and you can see the shadow - or scar - of the sign where it used to be. The New York Phoenix School of Design was a design school for women that started in 1944. In 1974 the school merged with Pratt Institute and changed it's name to the Pratt-Phoenix School of Design, meaning this labelscar is over 40 years old. The location has changed hands a few times since and is now a designer fashion boutique. Back in July I showed an old Merchants Bank of New York sign looming over the bank that acquired it in 2000, Valley National Bank. Recently, construction at another Valley National Bank location has revealed the labelscar of the old Merchants Bank logo (here is what it used to look like). 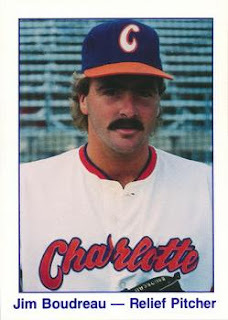 I have one card of Ricky Baker, from 1984 TCMA. Playing career: Outfielder Ricky Baker played six seasons in the Indians and Cubs organizations. In 664 games he hit .276 with 14 HR, 219 RBI and 249 SB. A fuller account of his career can be found at Jackson’s Autographs. Where he is now: A Physical Education teacher at Oak Park River Forest High School in Illinois. Google Autocomplete results: He is eighth when you type Ricky Ba, between Ricky Bats, a musician, and Ricky Bahl, referring to the Bollywood movie Ladies vs. Ricky Bahl. The first entry when you google Ricky Baker is not the ballplayer but a character from the movie Boyz n the Hood. Manhattan's famous grid street system was originally planned in 1811. Over the next ten years, surveyors mapped out the grid and marked intersections with stone monuments or, when the area was too rocky, iron bolts. These proposed intersections included the area that eventually became Central Park, so some of these intersections were never created. 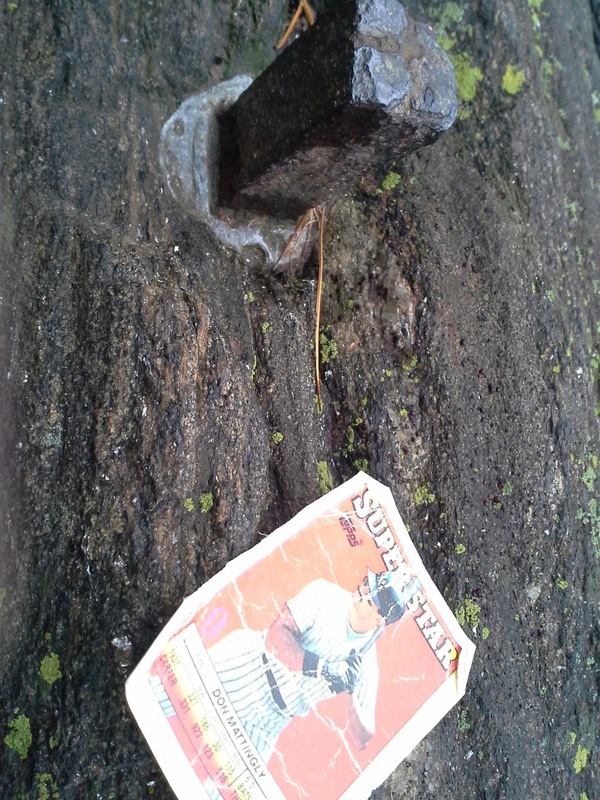 In 2003, a geographer discovered that one of these bolts is still in place, now 200 years later! A year ago that card was mint. Now it too looks 200 years old. Some people who write about this bolt don't like to give out accurate directions because they fear someone will remove it. However, others have given the location quite precisely. I will just say that had there been no Central Park this would have been the intersection of 65th Street and 6th Avenue. I have one card of Jim Auten, from 1984 TCMA. Playing career: Outfielder Jim Auten played six seasons in the Expos, Orioles and Cubs organizations. In 669 games he hit .242 with 47 HR and 297 RBI. Where he is now: Mortgage Advisor at Alpine Mortgage in Escondido, CA. Google Autocomplete results: He is seventh when you type Jim Aut, between Jim Auto Salvage, a car salvage business in Florida, and Jim Autrey, a hunting equipment salesman in Texas. Another prominent Jim Auten is the former Vice President of Sales & Marketing at Waste Industries. Coming up next: The next profile will be Ricky Baker. The son of Hall-of-Famer Lou Boudreau, Jim Boudreau pitched five seasons in the Cubs and Orioles organizations. In 150 games he went 30-26 with eight saves and a 3.57 ERA. Now the Staffing Manager at Magid Glove & Safety Manufacturing in Romeoville, IL, he kindly answered my questions about baseball cards. "I started to collect cards when I was younger and I do have some old cards from the 60’s/70’s. However, I was never what you would call an “avid collector”. I do have a number of star cards (i.e. Mantle, Ryan, Mays, etc. ), but certainly a lot more of the “who is that” cards in my possession. When my son was born, I started to buy the Topps complete set each year to set aside for him. I think he’ll appreciate that down the road. As for now, the only cards I collect are of my dad (Lou). As for my cards, I only have 2 options (Midland Cubs / Charlotte O’s). Of the two, the Charlotte card is my favorite. As for the Cubs card shot, they didn’t say what the picture was for and told me to 'just stand there a minute', which I did. It would have been nice to get into some sort of ballplayer stance or position AND find a spot where our field didn’t look like a playground (more dirt than grass)." 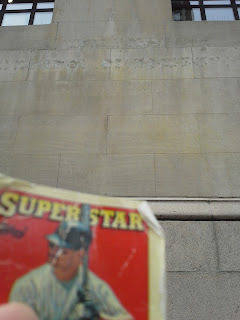 Always nice to scratch off a big star like Pujols from the list. Another big star out of the way. What a terrible picture of a pitcher though - it has his whole body except for the hand throwing the ball! Joba Chamberlain here has two hands but apparently no eyes. Yikes! Joe Housey pitched six seasons in the Cubs organization, winning 42 games. His best season was 1980, when he went 10-2 with 1.50 ERA for Geneva. Now a major league scout for the Rockies, he kindly answered my questions about baseball cards. "I was an avid baseball card collector most of my young life. Early on I had heard many horror stories about cards being thrown out by parents. So, one of the first things I did to prevent this was to introduce my mother to my baseball cards. And from that point on I never lost a baseball card. So I would recommend to all collectors to do the same. Not only will this prevent a loss but may also result in your mother or father coming across some cards that somebody else is giving away or that they may find somewhere. A little prevention can go a long way." I have one card of Justin Arneson, from 2003 Bowman. 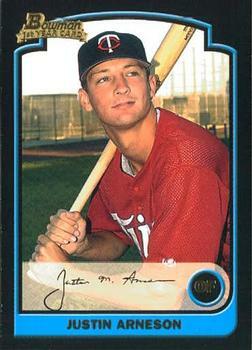 Playing career: Outfielder Justin Arneson played in the Twins organization from 2002 to 2006. In 275 games he hit .250 with 13 HR and 111 RBI. Where he is now: Financial Advisor at Edward Jones and Volunteer Baseball Coach at Minnesota State Community and Technical College. Google Autocomplete results: He is sixth when you type Justin Arn, between Justin Arnett, a newlywed in Florida, and Justin Arnold Twitter, referring to an actor. Another prominent Justin Arneson is a Research Scientist at CPP. Always very happy to add a Jorge Posada rookie to my collection. Lots of very recent cards in this trade, including this nice shot of Carlos Beltran. Hope he still has something left in the tank this year. Believe it or not I never had a card from this set before. I have most of the previous sets but hadn't had any with the Topps 40th anniversary logo from 1991. Billy Petrick pitched in the Cubs organization from 2002 to 2008, making the major leagues for eight games in 2007. He still pitches in independent ball, appearing in sixteen games for the Amarillo Thunderheads last year. The brother of recent Cardinals minor leaguer Zach Petrick, he kindly answered my questions about baseball cards. 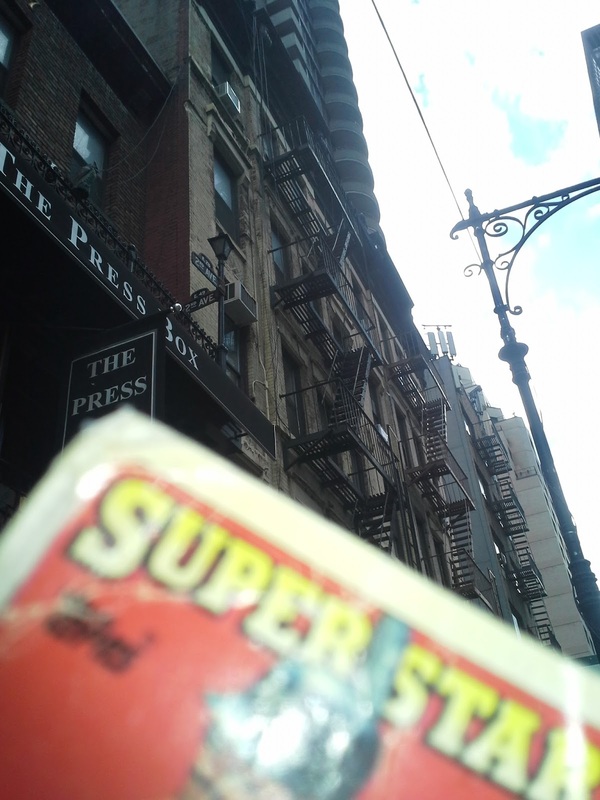 "The first card I ever had was with Topps. When I signed the contract I just scribbled my name on the page quickly, not realizing that they were going to be using that signature on my card as well. I'm pretty sure it looked as if a second grader wrote it. I'd say my favorite card of myself is one that I don't actually even have a copy of. 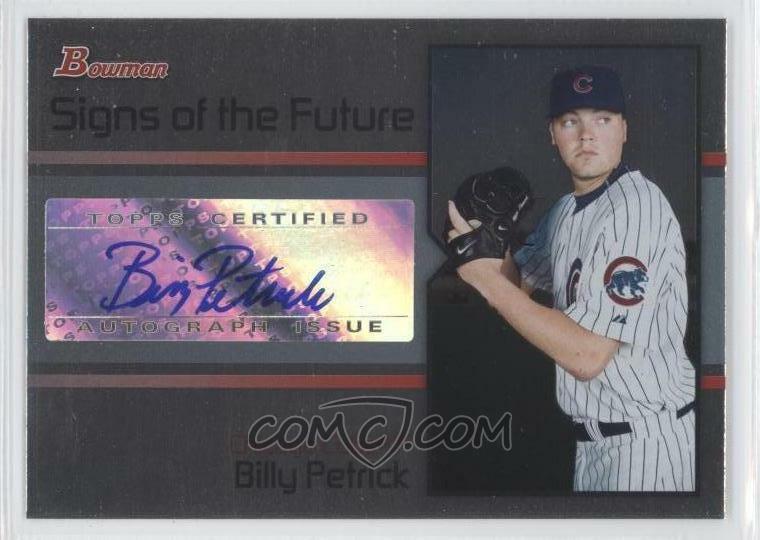 It is a Topps Signs of the Future Cubs card. The picture isn't displayed vertically on the card, but instead horizontally. I came across it online one day... Didn't even know it was out there. I don't really collect baseball cards, just a few of mine and now my little brother's." Catcher Doug Gwosdz played four seasons in the major leagues for the Padres. In 69 games he hit .144 with one home run and eight RBIs. Now a UPS supervisor in Texas, he kindly answered my questions about baseball cards. "I do not collect baseball cards. My favorite of my own cards is my Padres card in my catchers gear. I loved playing the game and still love it today." Elvys Quezada pitched six years of professional baseball, mostly in the Yankees organization. In 142 games he went 25-15 with 2 saves and a 3.37 ERA. Now a rookie-league pitching coach in the Yankees organization, he kindly answered my questions about baseball cards. 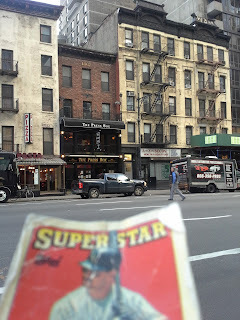 "My favorite baseball card is a Pedro Martinez card from when he was with the Dodgers organization early in his career. I had collected baseball cards growing up and have a set of all my cards from my playing days, along with some of my baseball buddies. All my cards have gone to my 8 year old son. He enjoys flipping through them and asking about the older player that he doesn't recognize." Infielder Casey Candaele played nine seasons in the major leagues for the Expos, Astros and Indians. In 754 games he hit .250 with 11 HR and 139 RBI. Now the first base coach for the Seattle Mariners, he kindly answered my questions about baseball cards. "I have one card in which I looked like Gazoo from the Flintstones. I was wearing the double ear flap helmet and my head looked extremely large! Favorite card would be one where I was playing 3rd base in Wrigley and I am leaping for a line drive. Looks like I am about 5 feet off the ground, which with my stature, would make me approximately 10 feet tall, and I really like that thought. Was not, and am not a card collector." Garvin Alston pitched eight seasons of professional baseball, mostly in the Rockies organization, winning 33 games and saving 34. He made the major leagues with Colorado in 1996. Now the bullpen coach for the Arizona Diamondbacks, he kindly answered my questions about baseball cards. 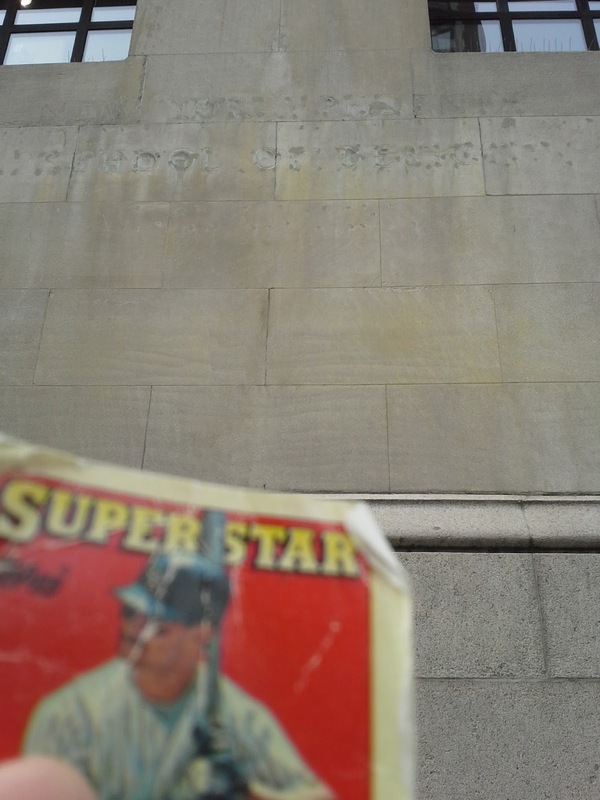 "I am not a card collector, my only story that I would have about any one of my baseball cards, is that in one of my cards I was using a teammate's glove, Mark Thompson." Thanks! I would guess that this is the card he is referring to, as it is his only one with a tan glove. All his other cards have him wearing a black BEN glove, like this one, or a Louisville Slugger glove with his name clearly visible. Catcher Luis Exposito played nine years of professional baseball, mostly in the Red Sox and Orioles organizations. He made the major leagues for nine games with Baltimore in 2012. Now a youth baseball coach in the Miami area, he kindly answered my questions about baseball cards. "My favorite card is a Charles Johnson card I have. I used to collect cards, I have about 10 sheets full, but I stopped collecting after I was about 10 or 12." Darren Sack pitched in the Giants organization from 2004 to 2007. His best season was 2006, when he went 7-3 with a 1.94 ERA for San Jose. 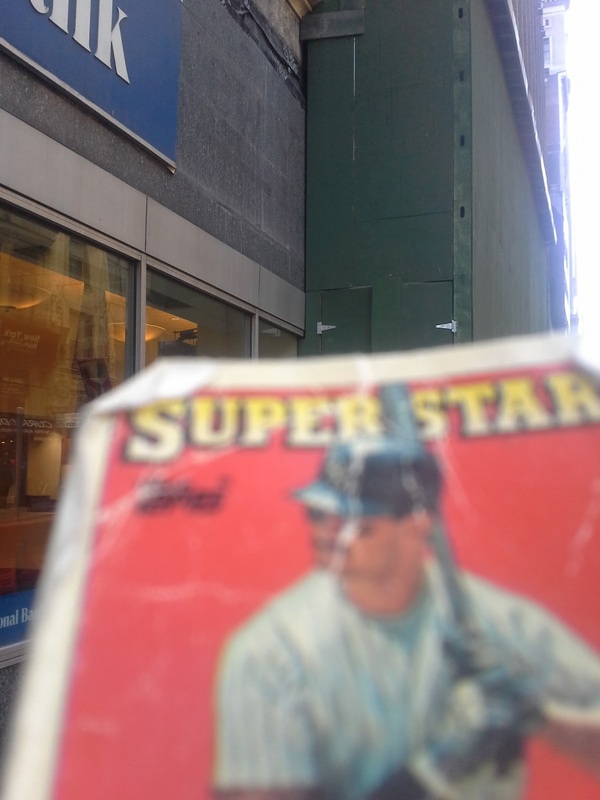 Now a Program Manager at Blue Data in San Francisco, he kindly answered my questions about baseball cards. - Do you have any stories about cards of yourself or of other players? Very strange to get someone sending me my card in the mail to sign and return to them. I once received a letter written in Hebrew because they found out I was Jewish. Had to use a translate tool to figure out what it said. - Do you have a favorite card of yourself or of another player? I think everyone that collected cards would agree that their favorite card was the first one of them. Kind of feel like you made it a little bit. - Do you collect baseball cards? I collected a lot as a kid. Used to save up my allowance every week and ride my bike 4 miles round trip to a shop called Ball Cards and Collectibles. Would sometimes just buy some packs and would sometimes save up my money to buy a single card. I still have about 20 complete sets from the late 80's and early 90's. From the 1910's to the 1960's, NYC street signs were blue with the street name in white, with the cross street in a raised area on top. These were known as "humpback" or "camelback" signs. They are no longer in use anywhere in the city, but you can still find some slightly out of place, above the second-floor awning for the Press Box bar on Second Avenue between 49th and 50th streets. If you zoom in on the picture below you can see one of them was for the intersection of 2nd and 49th and the other for 2nd and 28th. I have one card of Derek Barrows, from 2003 Pepsi Grandstand Salem-Keizer. This is a personally-autographed card received in a recent trade with Prowling Cat. Playing career: Derek Barrows was a third baseman in the Giants organization in 2003 and 2004. In 95 games he hit .213 with 3 HR and 16 RBI. 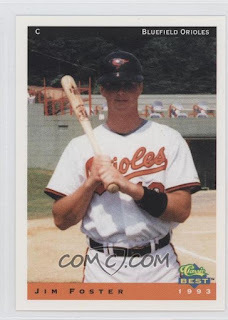 In independent ball he converted to a pitcher and later pitched in eight games for the Orioles’ rookie-league team in 2007. Where he is now: Regional Client Relations Director at Epic Health Services. Google Autocomplete results: He is fifth when you type Derek Barr, between Derek Barron, a golfer, and Derek Barry’s Bootcamp, referring to a fitness instructor. Another prominent Derek Barrows is a broadcast operations technician at Echostar.